What is the magic of a word? That words communicate at all? I'm announcing today my new website, http://www.yellowstonemagic.com/dance. 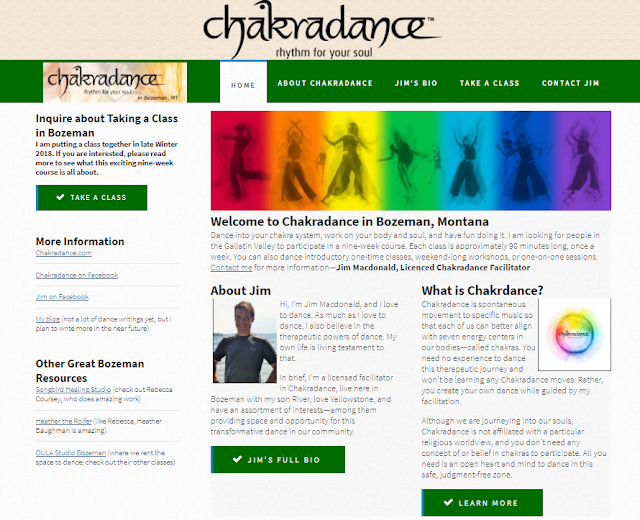 If you live in or near Bozeman and are interested in Chakradance, please contact me. I'm very excited now that I'm a licensed Chakradance facilitator. I hope I can share this wonderful transformative dance with you. I just had the most beautiful dance to the heart chakra. Let me try to find the words to describe it. It actually began before the heart chakra – in our abbreviated dance through all the chakras. In the third-eye chakra, I began to see dancing pretzels. They danced on an earth of cotton candy, surrounded by snow that fell as popcorn. There among them was the pink elephant who could fly. At times, I was but a feather flying and tickling these dancing pretzels, making them laugh, making the pink elephant who could fly sneeze. This picked up into the heart chakra dance, and I was narrating everything I was seeing in a soft voice as I saw it. There were the dancing pretzels, sometimes dancing like the Rockettes, sometimes just holding hands in a circle. There was the pink elephant who could fly. The falling popcorn. The cotton candy fields. Candy apple trees. There too was I, now not a feather, but just myself, dancing like a bird, sometimes grabbing a pretzel for a twirl. Then, I saw a woman in an emerald green dress. I know who she is, but I will not share. I walked over to her, and I asked her if I might have this dance. And she said yes, and we danced a beautiful dance on cotton candy dance floors in and around dancing pretzels as a flying pink elephant smiled over us. But we did not simply dance – she and I – we then looked out of our circle. We grabbed homeless people, we wheeled in people who could not use their legs, we brought in the forgotten, and came in with a cart of misfit toys. We all danced together – us and these misfits and the woman in green who will not be revealed – and in the middle was the pink elephant who could fly showered with love. Then, I saw my son – my beautiful River. And he brought in his misfit friends. And they danced with pretzels. The popcorn began to smile, and I turned back to feather form, tickling and making people laugh, and then me again. I’m narrating out loud everything I’m sharing here, and I’m narrating that I’m narrating. The scene changes. I’m now in the Norris Geyser Basin in Yellowstone National Park, at the very spot of my first kiss. I’m with the woman in emerald green, and we look into each other’s eyes, still in a swaying dancing way. But then we look out at the beauty before us. We open up our arms to it and invite it into us. This is not the love of a selfish couple, a romance only for the two, the first kiss of a boy who didn’t really know how to kiss. This is an openness to the world, a love for all that’s in it. And so came the elk, and so came the buffalo, and so came the wolf and the coyote and the fox, and so came the moose, and so came the grizzly bear and the black bear, and so came the beaver, and so came the pine trees and the fir, and so erupted the geysers all around us, and there too came the dancing pretzels, and the pink elephant who could fly was smiling down on us, and all the people who have been forgotten were there with us. And then came my son – my dear River. And he runs into my arms, and he says, “I love you, Daddy. Are you having a nice day?” – he says that nearly every time I see him. And I cry – and I’m really crying (I’m crying now writing this) – “The best day … the best day of my life.” And we hold each other, and we cry, and the world dances around us, first the lady in green, and around her the dancing pretzels, and around them geysers and animals and pink elephants who can fly in a sky of snow and falling popcorn. The love I feel right now is tremendous. I ended by wanting you all to join this scene and dance with us. This world is for you; this dance is for you. You are invited into my heart, into the strange curiosities of my mind, into the silliness, into the light touch of a feather, into a world where pretzels dance in a field of geysers, in a place I call Venus on Earth. You are always welcome in my home, in my dance, into my surrealism. And like an old movie, we bowed as the curtain closed – the last thing you see is a dancing pretzel and the hint of a pink elephant ear. And, closing credits. Living in the Gallatin Valley in such close proximity to the most beautiful place in the world – Yellowstone National Park – surrounded as we are by mountain ranges on every side of us, immersed with a sky so big that you can see forever even on the vast majority of cloudy days – we derive our sense of beauty from the striking and endless beauty around us. The valley floor contrasts with the rise of the Bridger Mountains. Very cold waters in the region mix with very hot. The colors in our morning and evening skies are like few places in the world. It is not hard for me to write just these few sentences because my view at work gives me a striking vantage on the Bridger and Tobacco Root Mountains. I know if I could turn 90 and 180 degrees that I’d have equally stunning views of the Madisons and the Gallatins. We can muse forever on what makes this place beautiful. One of the notions that seems obvious to me is that beauty provides a kind of endless diversity, one that never grows dull on the senses. The place will not allow you to take it for granted for very long. It is always full of pleasing new dimensions. In philosophy, there are these obvious truths called tautologies. Perhaps, the most famous one is expressed in the law of identity – “p = p“. You are you; I am me; something is the same as itself. There are other forms of tautologies. What we need to remember is that tautologies are always true; we also need to know that they can connote needless repetition or the stating of something so obvious that it does not need to be said. Either I am here, or I am not here. You will either be or you will not be. Tautologies seem quintessentially uninteresting. You might even argue that they are the ugliest things you can imagine. Not only do they not say anything new, but also they dull you by saying it in a needlessly bulky way. Do I really need to say “I am me”? Isn’t it enough that I am? However, I think tautologies are infinitely fascinating and that even our love for this valley or for anything anywhere else we may live is nothing more than a new way of expressing a tautology. When we mistake the staid quality of particular tautologies like “p = p“, we run the risk of confusing the mere body of the tautology with its beautiful embodied soul. What possibly could I mean by that metaphor? Let’s try to reduce truth to its smallest possible component. What if instead of saying “p = p“ I said instead “p“? I walk up to you on the street and gleefully announce “p!” You probably are going to wonder where someone urinated or something of that sort. You do that because saying “p“ by itself is never enough to express any truth. You have to fill in the blanks. What is this “p“? You sniff around, hop up to avoid stepping in it, but you have no idea what it is I really mean unless you know what “p” actually is. So, Okay, maybe I should say something like “p is”. Yes, you might think that’s a strange thing to say and still have little idea what that means, but at least it's a complete sentence. Yes, indeed, whatever “p” is, it most certainly is. Or it is not. Yet, you can still have some conversation about it. Yet, notice what your mind has done. In order to grasp the meaning of a simple sentence with a subject and a verb, you have unwittingly in your head turned it into a tautology. Either “p” is, or “p” is not. Another way you can put that is that “p is p“, which logically means the same thing as the disjunction “either p is or p is not.” You will still fill in a context for which the “is” relates. We cannot assert truth, then, by reducing it to something less than a tautological form. There is no “om” that reduces the world to itself unless one means that “om is om” Try expressing anything true without a context. There is no way to do so. We can spend more time expressing why, but that is true of anything. Any attempt you make to express why you can simply say “p“ or “p is” will result in you saying something more. However, go ahead and say “om” and see if I understand you without either of us making reference to anything else. If you can, it’s a wonder that you could make sense of my sentence asking you to do that. So, not only are tautologies true, but also truth cannot be simplified beyond its tautological form. Now, this is fascinating. Why? If “p is p“ but you cannot assert simply “p“ by itself, then it means that the nature of “p“ is such that it has to be expressed as containing some diversity within itself. What I mean is that “p“ must also have as part of its nature that it must be expressed by a subject and with a predicate. It doesn’t matter that the predicate of “p is p“ is self referential; it is still necessary to its concept that it be expressed through aspects which are not the same. Predicates and subjects are not the same in any sentence, even if “p“ is still “p“ That means the simplest notion of identity still entails a kind of internal diversity. So, there is no “p“ without a world of context, without a reference to something that is not merely “p“ as “p“ “P as subject” is not “P as predicate” even if “p is p“ must be true. This is a surprising conclusion and opens up Pandora’s box, right? Is it not also true to say that “1 = 1” and “1 = 3 – 2” and perhaps also that “1 is the loneliest number” and even that “3 – 2 is the loneliest number”? We are not equivocating. If we are saying things which are true that follow from the nature of tautologies, then there are infinite many things which we can say while anchored to our tautologies. If identity is true, so is it true that identity entails infinite diversity of any true statement. Why write about this subject? I think what I am trying to get across is that the study of philosophy is not an abstraction that is distinct in any substantive way whatsoever from the world we inhabit. When philosophers talk about Truth, Beauty, Being – with all the capital letters – they can and should be talking about notions that are really the same as the ones we are expressing about our world. They are only abstract in the sense that we talk about them as generalities, but they are not abstract in being otherworldly or perfect ideas of which our world only is a mere replica. It is to say we should not run away from the trail of truth, virtue, logic, and several thousands of years of jargon built to facilitate the discussion of our world. I am an activist. I do care deeply about the injustices in the world – to people, Animals, the land, and our overall environment. Nevertheless, I hope I am also a philosopher. To deal with big concepts like injustice and working toward a world that looks like we want it to be, we cannot be afraid to do the hard work of gazing into the depths of these ideas. We cannot simply assert “injustice” and hope everyone knows what we mean. We have to tie it to a context; we have to reach that subject into a predicate. What is “injustice”? Well, it is injustice. Yet, to tie that to the endlessly diverse context of our lives, we need to be willing to explore the tautology further even if the path can often be littered with all kinds of ugly and ineloquent things. One of the central goals in all of my reporting from the movement’s big events is to share the story you could not possibly get from any other media source. Any number of sources can tell you the basic who, what, when, where, why, and how many. They can also paint a broad brushstroke of some mythic overarching theme of what was happening. Rarely do we get the millions of individualized stories, emotions, and dramas. You can bet that somewhere hearts were broken in those crowds, that elsewhere someone else fell in love. Any given person was there for any number of reasons, and they are all ultimately relevant to what actually happened. In my case, I do not so much try to share with you every detail, like every bathroom break I took, or the final moments before falling asleep, but I try to evoke that all that goes unwritten was happening, that every experience is potentially rich. If there was something uniquely special that you might have missed, hopefully I have found it and given it expression. Much has been written about the big UFPJ march on August 29, and I’m sure plenty was written about the sizeable marches on August 30 and the preceding events on August 28. I may be able to fill in some more information about the basics that you might not have had; however, to be honest, there’s not all that much more on that score that I can add. I can, however, tell you what it was like for the DC contingent that was near me. My days were spent dealing with the housing issues arising at West-Park Presbyterian, taking phone calls from DC from people looking for bus rides, and much of the time helping Genevieve and others care for our blind companion, Paul the Peacewalker. In those experiences, I think there is analysis and reflection for the movement at large and the success of these actions in particular. For, it is not whether CNN carries our message accurately to the countryside outside of Peoria that matters most. That is something beyond our control. What matters most is how we take care of each other and ourselves. That’s what I believe. I know I risk sounding self righteous in saying that, but it makes it no less true. In what follows in this and the remaining parts of the story, the degree to which people took care of each other seemed to have a direct correlation with how I felt about the success of the trip. In any event, what is to come is a story of big events many of us participated in and the story I was living inside of these larger gatherings. The days involved cover DAWN’s August 27 bus trip to New York, our stay at West-Park Presbyterian Church, and our attendance at the Green Party’s “A Green World is Possible” festival, the great big UFPJ anti-war march, and Monday’s “Still We Rise Coalition” march. Much more happened in between and all around. The days also involve the interpersonal challenges that arise in the mix of things. Months of planning and preparation finally gave us in DAWN a chance to see our work come to life. There is so much life before the “coming to life” that it is no wonder that there is such controversy where the one begins and the other ends. Nevertheless, there was something profoundly different inside of me being able to sense now what was only imagined before. The bus was real, the people on the bus looking at me were real, the road was real, and New York was real. Someone wisely said that the best laid plans of mice and men often go astray, but sometimes they don’t. Our bus trip to begin the protests at the RNC on August 27 could not have gone more smoothly. A full bus of DC activists left Union Station that Friday evening with our sights set on New York. Check-in went smoothly except for the fact that one of our passengers brought much more than any of us anticipated him bringing. This passenger planned on going to New York to sell buttons and had traveled with DAWN in the past, but none of us had any idea just how much that entailed. Throughout the week, these little unexpected things created organizing challenges that kept me from simply relaxing and having fun. Nevertheless, everything else went so smoothly. The bus left for the highway, and we tuned into “Democracy Now,” the show that most people in our circles listen to for news. Of course, most of the show was about the Republican National Convention and the protests that were about to happen. In Boston, I had personally been disappointed by the show because it seemed to spend more time inside the convention than outside of it where activists were having some success in getting their messages out to the public and to the delegates. Even so, “Democracy Now” is a great help to our movement, and we listened attentively for the first half-hour of our trip. After that, the bus became an open mike on wheels. I began by welcoming everyone to the bus and talking about why we were going to the RNC. Soon after, the mike filled with poetry from the DC Guerrilla Poets and followed with a series of people speaking out. Of special note was Charlene who came all the way from Fort Lauderdale just to ride with us. She beamed with happiness despite the fact she told us that she was losing her home in part because she was traveling with us. Even so, she said she never felt more wonderful. For the next two hours, people spoke, sang, and shared poetry. We even watched an 8-minute trailer for a documentary from a DC-based woman named Laurel who is seeking funding for her project. Laurel was not with us, though I would run into her later in the week. The riders all seemed happy with the bus trip. Ellen from Prop 1 had brought an awful lot of food and water that nourished all the passengers on the bus. One passenger, who had moved from Texas, said that this was the best bus ride ever, a luxurious coach with entertainment and lots of great people. As an organizer, that’s just the sort of thing that is most gratifying to hear. Genevieve helped make sure that people had food and that any medical needs were met. For instance, she attended to one passenger who suffered a bee sting. Andy played an important role giving out information and guiding our bus trip in the final stages into New York. Any rest that anyone could give me was important to me because at times it could feel as though I might never get to have the slightest bit of fun during the entire week since I was making sure everyone else was. And, while sacrifice is such a wonderful thing, it does not mean that we always want to be doing that rather than something else. It would not be sacrifice if it were easy, right? About half way through our trip, I received a panic call from Suzanne, a friend of ours in DAWN, who was already in New York. While on the phone, she was witnessing the mass arrest of bicycle riders participating in a Critical Mass event. At that moment, it was hard to get details because she was in tears, but from many reports we subsequently got on the bus, we learned that over 260 people were arrested after a successful 2,000 plus person bike ride. Some reported people climbing the fences at St. Mark’s Church (where the convergence headquarters for the protests was) to escape the police. I never became clear about what started the incident, but I know that people like Suzanne were quite frightened by it all. As she cried, I gave her a press contact to try and reach. Immediately after the call, I announced the news to our bus. Our wonderful bus driver, Percy, worried that it would slow down our entry into New York. In the end, though, there was only a minor delay in traffic, and all was well. By about midnight, we arrived at West-Park Presbyterian Church at W. 86th and Amsterdam on Manhattan’s Upper West Side. Percy told us to “give them hell,” and we unloaded the bus. That took longer than we anticipated because of all the equipment of the button man. Inside, Julie from the noRNC housing team and Hope from the church greeted us for the night. When we arrived at West-Park and saw Julie and Hope, I perhaps felt better about it than anyone else. Here was a building where people could stay who could otherwise not afford to go to New York unless they happened to have this free place to stay. All of the hard work by Genevieve, Sam, Andy, Ryan, and myself was right before my eyes. Also before my eyes for the first time was Julie, whom I had talked to repeatedly on the phone. She worked so hard to house us as well as other groups in New York. Without her efforts, I wonder how well everything would have come together. It was the security of housing, whether people used that housing or not, that made people feel comfortable about long term commitments to coming. Perhaps, I regret putting such an emphasis on housing, but I do not regret it much because the fruits of that effort produced so much good. West-Park Presbyterian was an old church, but it had more comforts than you might expect. While the church was dark and felt as though it might be nearing its last legs, there were some surprising comforts. The church had showers for our use. What’s more, we did not have to sleep simply on uncomfortable floors. The church had plenty of gym mats that gave us cushion on the hard floors of the sanctuary and the upper room, dubbed by Mike the “Romper Room”. Besides the fact that we had to vacate the church by 8:30 every morning and could not return except in the evening, there were very few rules. The only rule of any significance was that no one was allowed to smoke or set fire to anything. You’d think that rule was of no significance, but as it turns out, one of our guests repeatedly broke it. Before bed, those of us staying in the church held a meeting to go over the ground rules with Julie. One of my main worries was getting some help. Every evening, we needed to watch the door after the church staff left the building. That ultimately meant that I was responsible for making sure that task was filled. If no one filled the task, it was up to me to abandon my day early to come back and watch the door. If that failed to happen, everyone would be locked out. However, it was not easy to get volunteers. That left me feeling somewhat blue because it could mean that all my days would be abbreviated; however, it was something I was willing to do to make sure that the trip was successful. Another issue was taking care of Paul the Peacewalker, our blind companion. Paul was not always blind. You see, in 1987, down in Forsyth County in Georgia, Paul was at an anti-KKK rally. One of the Klan members hit Paul in the eyes with a brick. During surgery, he developed gangrene, which eventually took his sight and six of his fingers. Despite the illness, which will take his life far too short—he’s only 49—he continues to be one of the most active members in the peace movement. Most will recognize Paul’s gigantic peace sign with which he walks wherever he goes. Blindness and the steroids and other medication that Paul is on make his mobility extremely difficult. He has trouble with his balance, and he needs someone to lead him at all times. Yet, how can someone say that Paul should not have been there? How can someone say that his life is less valuable than ours is and that he should be confined to a nursing home while all his being is about going out into the streets and marching for peace? I believe that we have a responsibility to the disadvantaged and that it is our community responsibility to make sure that the least of us has the same advantages as the most of us. If that meant that we could not have as much fun as someone else just so he could go to perhaps his last protest, then that’s what it meant. So long as one can help, one should. To a greater or a lesser degree, people did help with Paul. However, it was the perpetual priority of the early part of the week. Paul had so much to offer, in his story, in his persistence, and I am thankful to those who recognized that and helped out. We had our issues to take care of, but I was generally quite upbeat about our situation. Sure, we had a button guy who was irritating the church because of the amount of space his stuff required, and we had a blind man with us that required a whole lot of help and attention. However, for me, we also had dreams coming true. We worked so hard to see this happen. When people coming with us thanked me repeatedly, it was so gratifying. And, then I’d see Julie and want her to know just how much we appreciated the space. I hope I expressed it enough. We also had space, if we needed it, over at Jan Hus Presbyterian over on the East Side. In fact, we planned on using that space the next evening for the DC Cluster meeting. I definitely felt a great deal of satisfaction. A Green World is Possible! Arrest the President! Saturday, August 28, brought with it our first day of action; however, the dominant thought I had was to rest up and save my energy for the days to follow. Many of our friends went over to Brooklyn for another March for Women’s Lives, which had an estimated 30,000 people march over the Brooklyn Bridge. We decided to take a more low key approach and witness the Green Party’s “A Green World is Possible” over in Greenwich Village down in Washington Square. We began our day at a small diner on Broadway called “The City Diner,” which became our little hangout the first few days. It was not that the food was good, but it was a place to go and relax. Since that took awhile and since we had Paul, it did not make sense to take a long march across the Brooklyn Bridge, and so we headed straight down to the Green Party festival. So, after a subway ride, we soon arrived in the park, where we would spend most of our day. We chose to go down to this festival in part because of the involvement of the DC Statehood Green Party in our planning. Many of our friends are Green Party activists, and our friend Ann had encouraged us to go down there. David Cobb, who many still do not realize is the Green Party nominee for President, Peter Camejo, Nader’s running mate, and Medea Benjamin planned on speaking. It seemed worthwhile enough to attend without risking us losing steam before the next day’s huge protests. The festival itself was rather poorly attended. Apparently, there had been some confusion over the actual location of the event, and some hypothesized that that affected numbers. The women’s march was a bigger draw, and there were several other competing rallies that day. What’s more, the heat was sweltering. I found myself becoming exhausted simply sitting on a park bench. The first few days in New York were dominated by heat, and so much of the time we spent trying to get enough water. As for myself, for some reason I had a very short fuse. Most people who know me think of me as remarkably patient, but for some reason, though I was in a good mood, I could not seem to avoid turning angry at any perceived slight. Genevieve can tell you how moody I was that day, and I’m not altogether sure why, except that I had this looming sense that something might go very wrong. Perhaps, I was getting tired of all the last minute calls from DC asking for bus rides. If those calls had come four days earlier, we could have filled two more buses! Perhaps, I was unenthusiastic by spending all day with only about 200 other people. Perhaps, I was just exhausted. Whatever the reason, I was not myself, and it seemed I was this close at any moment from screaming at someone. Thank goodness that later in the day we had some good punk bands. The dancing in those moments helped ease a lot of steam. Anyhow, Paul, Genevieve, and I spent much of the day mysteriously heckling all the speakers on the stage, including Cobb, whom I plan on voting for in November. Paul has this habit of asking people at the end of many of his phrases, “Do you know it?” So, we kept saying back to him, “I know it, Paul!” and that phrase became an inside joke. We shortly combined it with the phrase, “Well!” This June at an event on prisoner abuse at Plymouth Congregational in DC, Rev. Hagler, who is the well-known pastor of that church, gave a fiery speech. One woman in the audience constantly yelled out to him, “Well!” at the end of many phrases. So, Genevieve, Paul and I combined “Do you know it?” with “Well!” and “I know it!” As speakers on the stage spoke, the more bored we became, and consequently the more we yelled these phrases out. Others listening looked back at us quite puzzled. We were puzzled, too, since we agreed with almost everything being said. I guess we needed more excitement. Eventually, the DC Guerrilla Poets arrived at the festival and asked us if we wanted to join them for an impromptu march around the nearby streets. We all wanted to do this very much. After some time and even being on stage for a presentation by the DC Statehood Greens that focused on DC’s lack of voting representation in Congress, we set out on our little march. Shahid, Moment, Gregg, Amber, and the rest of us walked down the street with a banner that Genevieve and I created which reads, “Arrest Bush for War Crimes.” We also brought some drums and some chants. It was a lot of fun. Some would yell out, “Money for books, not bombs!” Then, we would yell back, “Arrest the Pres-i-dent!” They would reply, “Money for schools, not jails!” We would yell back “Arrest the Pres-i-dent!” On each side of Broadway, we yelled this chant back at each other. A young man on the street with a drum joined us. Then, we ran into Luke from DC on his bike, and he joined us as well. After an hour, we went back to the park having had a great time. By this time, despite doing so little, we were exhausted. In large part, it was the heat. In some part, it was the physical part of helping Paul. For some reason, I never felt so physically drained as I felt this first day, despite it being the day we did the least. I had the responsibility to return back and watch the church, and so we did. Back at the church, Philip, one of the staff people at West-Park, greeted us. He was a great guy, very kind, with seemingly the perfect mix of knowing how to be diplomatic and knowing where to draw the lines. He told us that our button guy would have to move his stuff from a room he had stored it and that he would have to be out by 8:30 the next morning. Apparently, he had not left before 10, and this caused problems. Genevieve agreed to tell him since I had to go to a DC Cluster meeting that evening over at Jan Hus. I used the remaining couple hours to rest before taking a 45-minute walk over to Jan Hus. Despite feeling so tired, by the time I left for the meeting, I was ready for the walk. Going to Jan Hus meant walking across Central Park. Ann was worried since Central Park had some reputation for crime, but having lived in DC for so long where crime is so high and where I had already been mugged, I was not particularly worried. Even so, I was surprised by how empty it was in Central Park at night. All the streets bustled with activity, but I did not see one person as I walked on 86th Street across Central Park. What a strange feeling to have so much space to myself in a city so crowded. As I walked, I noticed the Central Park police precinct. It looked like a medieval torture chamber. It all felt surreal. The DC Cluster arose out of the DC Conventions Coalition, but it was distinctly different in its operating procedure. Whereas we created the DC Conventions Coalition around participating organizations and interested individuals, the DC Cluster arose out of the West Coast structure around individual affinity groups and clusters of affinity groups. The distinction seems subtle, but I think the difference made the difference in getting participation. Affinity groups are small groups of people working together on a specific purpose. They can be open to new members or closed to new members, and they can be more permanent or more temporary, but they are generally not formally recognized groups. In other words, any group of friends could be an affinity group. The old meeting structure was flexible in that it allowed anyone to participate, but it seemed rather conservative in its approach. Many individuals in the movement think of themselves as belonging to smaller groups and shun getting tied to a particular organization. Calling oneself a coalition suggests more formality. Calling oneself a cluster suggests that the process is basically decentralized and is at root still the product of what individual affinity groups decide. In reality, both ideas were essentially the same since the DC Conventions Coalition did not aim to be a centralized organizing body. However, for the reasons I have outlined, it seemed to make a difference. Our largest DC Conventions Coalition meeting never had more than 15 people. Our last DC Cluster meeting had about 30. What was really exciting about forming the DC Cluster was that we planned to meet as a DC contingent in meeting space in New York. That excited me because that was the original dream when we began the process in late March. At every rally I could remember that was away from DC and even several that were in DC, my anti-war group failed to do anything or plan any actions on the ground. Instead, we did nothing more than show up. The plan for New York always was to meet and organize on the ground toward actions happening in New York. Several DC affinity groups participated in the meeting, and a few had actions planned. That was exciting to me. What’s more, we met in space we were able to provide through our hard work. Perhaps, no one could feel better about the moment than me. Those of us who met that evening did not agree to a plan of action. Generally, because different groups had different levels of openness, different levels of willingness to speak with the media, different risk tolerances for being arrested, it did not make a great deal of sense to plan a mutually supportive action. Many of the participants wondered how the next day would play out, and lacking any sense of that, there was not a large appetite for making specific plans for the day of direct action on August 31. Beyond that, I am not going to go into the particulars of the meeting. However, we all generally agreed to encourage our affinity group members to congregate at the dragon, which was put together by a DC-based group known as “Don’t Just Vote.” That group planned on leading a feeder march into UFPJ’s main rally. There was a lot of buzz about the dragon, and the meeting confirmed that groups planned on congregating there. Mike and I walked back together across Central Park and headed home. On the way, we talked a great deal about the movement and about the ills of civilization in general. How ironic it was to me that people looked so fondly at Central Park as an oasis in the human jungle. Our civilization has become far too vast, I kept telling Mike. We can come to places like New York and enrich our experience, but it has come at the cost of making our lives far more complicated and alienating. Text messages, email, oil, cars, and bright lights made everything possible for us. The sheer mass of choices made life so infinitely complicated that we ironically became more and more restricted by our need to maintain the civilization that gave rise to these so called conveniences. It left people alienated from their families and neighbors and instead tied together by a popular culture that consists of sitting at home in an apartment watching television. We know where Beyonce is at any given moment better than we do our own brothers and sisters. Our homes have become prisons to support an unnatural system, one which disguises places like Central Park as wilderness. This is just the sort of conversation Mike and I were having, and I felt as though we were fighting the trend of civilization in that moment. Yet, what a long road we must walk to be rid of these roads, so that our world can be wondrous and larger than life again. When we arrived home, I found trouble involving the button man, who was worried that his stuff might get stolen if he were not allowed to sleep with it. Other guests had become annoyed with the noise he was making, and this created some conflict. After a long day, I did not want to have to deal with this sort of problem, but soon it was solved to everyone’s satisfaction. Of course, the next day, he failed to move his possessions to the designated location, and he came this close to being thrown out of the church. Soon, however, he became the least of our problems. In the middle of this, a call came from folks traveling from South Carolina whom Genevieve had arranged to stay with us. Peggy, Tom, and their guest misjudged the length of the trip and would not be arriving now until 4 am. This meant that I would have to stay alert enough to hear my phone ring to let them in. At 4 am, they finally arrived, and I staggered to the door to get them oriented. Their guest seemed to be mute, though occasionally he muttered a word. This guest would prove to be a tremendous challenge to us. No one told Peggy or Tom or any of us that he was a paranoid schizophrenic until we caught up with one of this person’s acquaintances on Monday afternoon. This man would challenge our patience and goodwill by sticking his finger in Chris’s syrup, smoking a pipe in the sanctuary, walking around with my hairbrush, showing up uninvited into the church ahead of hours, following Genevieve and I around city streets, and ultimately lighting a candle in the sanctuary. Apparently, no one was responsible for this person, and no one let us know what he or she was dropping on our laps. To our knowledge, he did not attend a single rally, and it’s not clear how he ended up coming to New York. We were not sure whether the man was violent, and he repeatedly risked having us all thrown out. The man was ill, and that was very unfortunate. However, with a blind man we were committed to taking care of, a button man who was scattering his things all over the place—this does not mention the several pints of rice he mysteriously bought—and now a paranoid schizophrenic dumped on our doorstep, we all wondered how we would manage the rest of the week. Despite all of this and how little sleep I was managing, I woke up the next morning wide awake and full of adrenaline for the great big march that we knew was coming today. Most people who protested at the Republican National Convention chose August 29 as their day to protest. UFPJ had long ago put out a call for a major anti-war rally and march on the Sunday before the RNC. In terms of publicity, this march had plenty of it as well as plenty of controversy. For a long time, the city of New York did not give any permits out for the day. Finally, they approved a march permit that allowed the group to protest past Madison Square Garden, but they denied a rallying permit for a rally after the march in Central Park. After some fighting, UFPJ finally agreed to a permit along the West Side Highway, but soon after declined the permit. UFPJ said it was too expensive and too dangerous for so many marchers. While that was true, there was also political pressure from other grassroots groups who said that nothing less than Central Park would be acceptable and that they planned to go to Central Park regardless of what UFPJ did. When UFPJ picked up the fight again for Central Park, it lost. Finally, the city allowed the march to end at Union Square far from Central Park, but since the location was far too small for a rally, UFPJ urged people at Union Square to go home immediately. This sort of politics only helps to create buzz for protests. For a few it discourages them from coming, making them scared of police violence. For most, it galvanizes them to come and make the most of it. As the news of this march became more public, interest in it in places like DC exploded. If the explosion had happened just a little sooner, we could have bused our largest contingent ever to any march. Even so, we brought an awful lot of people, and many more came separately. Everywhere I went before the march large numbers of people claimed to be going to the RNC while only a small percentage of them planned to travel on our buses. This, in addition to evidence in New York, suggests that we undoubtedly had over 1,000 area residents there and perhaps many more. I like to think that our efforts helped magnify that number. Most people I talked to had seen our wheatpasting flyers across the city. Occasionally, we found ourselves on the radio. Event after event had us speaking about the need to go protest at the RNC. We handed out many thousands of flyers. We had radio spots on WPFW occasionally and also regularly on Luke’s pirate radio station. We talked it up to other groups and traveled to meeting after meeting. Our outreach certainly extended well beyond our normal reach, and we had the interest of people not necessarily involved in progressive politics. On our buses, for instance, we even had some Republicans against Bush. In the end, over 500,000 protested. Some think the number was closer to one million, but I do not think we reached that number. How can I say? I cannot, but over time one becomes better at gauging crowd size. I felt far more claustrophobic on the Mall during the March for Women’s Lives, which drew at least 1.1 million. However, I felt just as crowded as I did during the February 15, 2003, marches in New York. It’s a very poor science, but most sources coalesced around that number. For our part, we joined this very hot and steamy day at 20th Street between 5th and 6th Avenues where the dragon was being assembled. Many of you have heard about the dragon by now, but let me describe it. The dragon was 70 feet long, with a giant green head placed on top of some kind of cart or wheelbarrow. The rest was cloth and paper with wings that said “Self Determination”—listing all the places that should have self determination like Iraq, Afghanistan, and DC—and another that said “Don’t Just Vote”, which was the aim of the campaign. It took a large team of people to move this large float. What was remarkable about the dragon was that it also had an internal sound system in the dragon’s head. This amazing creation could play loud music, roar, or even wax poetic. It took an enormous amount of time and energy to put together and was quite a sight to behold. Our DC crew spent much of the time trying to take care of Paul. Because of the physical demands, no one carried Paul for more than 20 minutes at a time. So many people helped out or were willing to help out. Genevieve went around recruiting folks. Those who really helped us out a lot that day included Ethan, Dave, Tim, Pat, Pete, and Ann. It was so hot that any one of us could have gotten ill from the heat. It was an especially dangerous day for Paul, since water was limited, the walking severe, and the crowds dense. Genevieve worried a great deal about his survival. This caused her to worry to the extent that caused miscommunication with others. Paul, whether he made it through the day or not, wanted to be out here doing this. He would rather be not living at all than not have this historic chance to be on the streets speaking for peace. In the end, that argument won over Genevieve’s better medical sense. On 20th, the energy picked up enormously when a large group of people dressed in pink came in banging on buckets. Soon after, DC’s Rhythm Workers’ Union with their Mother Drum Ship came on the scene. Before you knew it, the dragon was pumping out jams. Soon, the entire sidewalk full of people was in the streets dancing. I can honestly say that I have never seen so much energy at the start of a march. It felt to me a little like the closing scene in Star Wars movies, which often have a parade with exuberant celebration. The scene was so joyous. Soon, without police around, the crowds removed the police barricades, and the sidewalks joined the streets as one big party. As we stood in this amazing festival of color, sound, and activity, I soon had a nagging worry. It felt so wonderful, but I wondered if this was the calm before the storm. Would people try to go to Central Park and get assaulted by police? What if the march grows so big and the police crack down on its size? I did not know what, but something did not feel right. Soon, a friend of mine from the Black Tea Society in Boston came up to me and asked, “Are you ready?” I stood holding the DC Anti-War Network banner and told him, “We’re ready.” He cautioned, “I hope so because something’s going to happen.” I have no idea what he meant, but we were all feeling pretty much the same thing, that something was going to happen. The feeder march took up more than one block. It was the greatest feeder march ever. Many of the visuals we saw in the paper the next day came from this feeder march. Many held a giant “No Bush” banner that could be seen from any spot looking down. At times, we walked right in front of that enormous banner. From the apartments nearby, people partied and yelled back at us in resounding approval. During the week, I don’t remember meeting more than a few people who showed any disapproval that we were there. In fact, over 70% of New Yorkers approved of the protesters, 68% approved of nonviolent civil disobedience, and even 11% claimed they would protest during the week, though I expect that that number was a bit high. Soon, we began the long, slow march, merging with the main march on 8th Avenue. Our friends on the DAWN buses arriving that day made it in safely, and some joined us for the march. It was great to see fresh faces like Ryan and Jeff walking with us behind the dragon. The dragon was so hard to move, and it slowed the entire march down and created a backlog of people behind it. Everyone wanted to be near it. Around us were an assortment of anarchists, pagans, and many activists from DC enjoying the party. It was the People’s Convention. Every so often, Pat would yell at the crowd with a small sign he made that said, “GOP Go Away!” He’d yell the words of his sign to thunderous applause. Generally, this was unlike other marches in New York. The pens were not a big issue. A court order forced the police to let anyone in and out of the pens, and this as predicted made the pens a lot less useful in crowd control. All along the path, you saw protesters on each side of the pen, on the roads and in the sidewalks. Eventually, we walked by Madison Square Garden, home of the convention, and also Penn Station. There, the dragon became especially slow. We saw a much heavier police presence, and occasionally I’d see paper being thrown at the police. Nearby, about 50-75 counter-protesters yelled at us, but they were pretty inconsequential compared to the large march. Darwin called me while we were early in the march telling me he had already reached the end. Apparently, the entire march route of 30 blocks was full with hundreds of thousands waiting to get on the street. No one could deny that this was a success. The Chicago protests in 1968 only had 6,000 protesters during the most fateful protests. Yet, in a world that seems numb to protest and because corporate media has become numb to the strength of grassroots social movements, many will still think that Chicago 1968 was more significant. Here we had over 500,000 people, and because there were few incidents, their significance is downplayed. I hope most of us know better than that. Of course, there was one incident that day that most people I know continue to talk about. Genevieve, Tim, Paul, and I got in front of the dragon and proceeded down W. 34th Street. In front of the dragon, the crowd was sparser since it was moving faster than the cumbersome beast. Here we were about to stop for a moment so that Genevieve could get some water for Paul. I worried that if she did not hurry that the dragon might catch us and that we would get caught in the thick crowd behind it. Then, seconds after expressing that worry, chaos broke loose. Behind us, we saw young people dressed in black running down the street yelling to “Move fast, move fast!” At that point, some panic set in. Moving with a blind man with poor balance was very hard, and now the crowd was beginning to panic. Then, behind us, we saw smoke. Our fear was that the police had set off tear gas. So, we started to move even faster. Young people continued to run down the street, and one pushed Genevieve in the back. The situation became very dangerous, and we were looking for a means to escape. Then, I saw one young man throw something like a paper tube at a police officer. Another officer tried to tackle the young man, who because of the sweat on his bare body was able to slither away and escape. Paul, not knowing what was happening, kept yelling at us to tell him what was going on. I was yelling that I didn’t know and that we needed him to keep moving. Finally, we ducked into a perfume store and watched what looked like a strange battle occur outside on W. 34th. The store we were in shut down its doors as confusion reigned, many of the people working in the store wondering why the protesters had resorted to violence. We reiterated that we had no idea what had happened and that we were not at all there to be violent. Outside, we saw young people in black retreat, and then we saw two police officers go back the opposite direction with fear in their eyes in retreat as the young people retook the space. Then, we saw the young people retreat, while some others of them took pens from each side of the street, putting them in the middle of the street to fortify their positions. They created gates that allowed more protesters into their space. Then, they relinquished the position in full retreat. Soon, the police came in larger force, followed by more police in horses. It was a strange back and forth battle where I could see no one hurt, but a lot of back and forth. So, what had happened? When the scene cleared, the police ultimately let the larger march continue. Eventually, we found out that someone had set the dragon on fire, creating a riot. Yet, who set the dragon on fire and why? Everyone we talked to was quite upset about the dragon being set on fire because it created a very dangerous situation. If some of the protesters or some doing black bloc set the dragon on fire, then I knew I would be downright resentful. That dragon nearly caused the life of a blind man and many others who had no idea what was happening. We may all hate Bush, but no one group should be co-opted into the tactics of the other. I don’t think, as some have suggested, that the police caused this. The battle that followed was far too intricate to believe that this was not something that somebody had planned. The police would have had to have hired 100 protesters and created a counter-army that no one would have known about. Yet, there were and remain other mysteries that I hope get solved. There are people who face serious charges and have high bails for their part in this, and we do not know if they have the right people. I would like answers because I personally disavow this and any other violence used in the name of the movement, especially violence that sweeps up people unwittingly into some perverse notion of revolution. It’s not that “revolution” is perverse; it’s that this sort of silliness only creates the same old system that we have now. In any event, I don’t know what happened, but I do know that one of the most amazing spectacles I had ever seen was no more, and that our brilliant march suddenly felt tainted. We marched on not quite feeling quite as well. Sometimes, you can go on a really uneventful and depressing march to have something special happen toward the end that would make you feel good about it. Here, we had a spectacular and special march where something at the end left you feeling somewhat sour. And, yet, despite that bizarre hiccup, the march still felt great on the whole. We cut out of the march early, having run into Nat, Jill, and Legba, all of whom were staying with us at West-Park. From there, we decided to head up to Central Park to see what was happening. Of course, no one was supposed to be allowed to go to Central Park, and so we did not know what would wait there for us. Our feet ached, our spirits had been spun around all over the place from highs to lows. The sun was hot, and we remained somewhat thirsty. Paul was holding up remarkably well, and to be honest, I did not feel nearly so worn out as the day before. Even so, waiting and waiting for the subway to arrive was somewhat deflating. I was becoming glad that our day was beginning to end. At Central Park, we saw a large number of protesters coming in and out of the park. This made me feel great. We headed toward the Great Lawn, and there we saw tens of thousands of protesters hanging out on the lawns relaxing. It was so pleasant, a great way to unwind. In the park, some groups held a nonviolence training. Others drummed. Most just lay around relaxing. It was so nice, and the police left us alone. What were they so afraid of? Certainly not that inconsequential minority that set the dragon on fire, whom so many of the protesters instantly disavowed? The politics of the Great Lawn and why the police did and did not act throughout the week were great mysteries. I expect that much of the anger in Iraq has to do with inconsistencies in policy, lack of rationality, lack of perception of the reality on the ground. Here the police left us alone. Later, outside protests of Republican delegates at Broadway shows, the police randomly chose people to arrest. In one case, Legba barely escaped out of a plastic fencing he had been wrapped in by a police officer while he was simply observing the scene down on Broadway. However, at Central Park nothing like this happened. Who was pulling the puppet strings? After awhile, we headed back to the church quite exhausted. Along the way, we met one of our bus passengers from Codepink. She was with a crew that successfully unfurled a banner drop from a large building. During this escapade, she and her cohorts barely escaped arrest as they hid from police, who were looking for them inside the building. Throughout the week, Codepink successfully managed to get three of its high profile leaders on the floor of the Republican convention over three consecutive days. Each of Codepink’s co-founders, including my friend Gael, broke into the convention despite the fact that the Secret Service was looking for them and despite the fact that one co-founder, Medea Benjamin, had broken into the DNC a month prior in Boston. We congratulated our Codepink colleague on her success, and went to the church to rest. At the church, we had the usual circus to deal with. The troubles with our mentally ill guest became apparent while the church threatened to throw the button man out if he did not respect their wishes. However, the real issue for Genevieve and I was Paul. Both of us found ourselves depressed by the situation. Paul was scheduled to stay the entire week, and although so many people had been helping out, it was becoming much harder to manage. Many of our friends planned to leave that evening, and Genevieve was leaving the following evening. Others were unable or in a few cases unwilling to help out. It was not possible for one person to walk Paul around. Imagine that you are a shock absorber for a large vehicle and how long you could stand that. Every crack Paul walked over, every step he took down from a sidewalk, every misstep on the path pounded one’s body. While Paul certainly had it much worse in his condition, any fewer people helping out would prove to be a nightmare for Paul and everyone else. This reality depressed me and especially depressed Genevieve. What a world we live in that a man who was the victim of standing up against racism in the 1980s has been reduced to such dependence on a community that is not always ready to help out. I was willing to give everything up so that Paul could stay, but I also knew that I could not physically do it and that I could not do it at the expense of taking care of other people. In a vacuum, these decisions are easy. However, how does one help others in such a complicated set of contexts? No matter what, though, we were bound to feel bad about the harsh reality staring us in the face. We needed to talk with Paul and see if he was willing to return with Genevieve the following night. If he felt differently, then we would act differently. In the end, though, we felt we needed to be frank with him about the situation. The next morning at breakfast in the City Diner, Dave, Genevieve, and I spoke with Paul. While the man is blind, his faculties are certainly there. Throughout the time, he interviewed extremely well and was never boring to talk to. He’s someone who has done more than most of us, and he continues to do more than most of us in the cause of peace. Even so, it was a hard conversation. For the past couple days, Paul suspected that there was not enough help for him. Even so, he wanted to be there so badly. Yet, he agreed that it would be best if he went back with Genevieve that evening. I think his mood was not the same that last day he was with us. Certainly, he was not physically holding up as well. He was more tired, nearly fell down several more times than usual, almost fell down an escalator, and needed much more water than on previous more difficult days. Was this because he was truly wearing down or because he felt low as a human being? Either way, I wonder deep in my heart if we could have done more. If we could have, we should have. We are there to take care of each member of our community, to see to it that this is our principle responsibility. Yet, as I think back on all the help we got from all the people, perhaps it was just a task bigger than us. At least he got three entire days out of his house, a house he must rent, pay for his food, and take care of his basic needs for only $900 a month. At least he got away from the “dead beats” he says look in on him and steal his money. Even so, these were the lowest moments for me during the entire week. I felt sick inside that we could not do even more for Paul. Today’s big action was the Still We Rise coalition march. I think that the march had about 50,000 people. However many there were, it was really remarkable to see such a diverse and large group of people marching on a Monday afternoon. The march was mostly made up of poor people’s advocacy groups, AIDS advocacy groups, and other groups upset at the social programs of the Bush Administration. It was really a very great atmosphere. The UFPJ march for all its size was not nearly so diverse as this march. It was often as common to hear chants in Spanish as it was in English. Often English chants were in foreign accents. I was so happy to be among this crowd on this day. They worked hard on the march and pulled off a great event. Paul was the star of the day. Carrying his giant peace sign, Paul attracted the attention of numerous press. His picture appeared prominently in an Associated Press wire photo. Others interviewed Paul and sometimes his companion. A reporter from Spain interviewed him, for instance. Later, a graduate student making a documentary interviewed both of us for a film they hope to entitle, “This is What Democracy Looks Like.” They said they would let us know if they use the footage. The two major marches that day, this one and the unpermitted Kensington Welfare Rights Union march highlighted the plight of poor people. These issues touch me closely, having evacuated my own apartment because I could not afford the rent and unable to find a steady job despite having an M.A. Throughout the week, I found myself skipping meals occasionally because I lacked the money. In truth, I could not really afford to be in New York. Yet, for others, it is far worse. I have a support system, people who will not let me hit rock bottom. What do you do when the support system collapses? Do you have time or ability to get on your feet? If you do not have an education like me, what are you supposed to do? Do you even know what to do? Or, what if you have mental illness or a rare disease? The world is a dark place for those without support. Paul generally lives in that world, barely staying alive and looking far older than he is. Others we do not know about waste away in a system that has no patience to see the beauty of taking care of its least fortunate. We are all so busy being victims that we do not see how we victimize others. That thought would resonate with me throughout the week. Perhaps, it is why the harshest moments for me personally became some of my happiest. After the Still We Rise march, we did not do an awful lot. We were at an awkward time where it was too early for us to stop moving around but too late for us to take on another big project. Genevieve, Tim, Paul, and Vallon (a DAWN bus rider whom we gave housing to after he missed his bus ride back) all had a bus leaving later that day. Dave had the responsibility of watching the church that evening. I had nothing until a Spokes meeting that evening in Brooklyn for activists planning the next day’s actions. So, as a result, we spent much of the time milling about at a Progressive Tourist Bureau near the bus station. This was something of a front for the Democratic Party, but we used the space to drink water, eat doughnuts, and recover from the march. Genevieve and I returned to the church for Paul’s things only to discover a crisis. The church had miscommunications between its staff and its ministers. As a result, they had booked the space for a group of youth from Germany for Thursday night, meaning that we would have to vacate the space by then. This left my last hours with Genevieve one of scrambling for space for our people and working out details with Jan Hus Presbyterian. Eventually, we took our friends to the bus station and said goodbye. It was my last chance to see Genevieve that week. She and I barely had any chance to be alone the entire time, and I was going to miss her greatly. She needed to return to nursing school, and I needed to finish the job here in New York. So much would happen in our time apart, and my biggest regret was that she could not share all those experiences with me. Even so, she continued to play an important role as we shall see as this narrative continues. The most anticipated day for many of us was approaching. August 31, dubbed A31 by organizers, was supposed to be a day of nonviolent direct action occurring all over the city. None of these actions would have permits, and all of them aimed in some way or other to take attention away from the Republican National Convention and onto the messages of the streets of the city. While no single organizing body was responsible for these actions, many groups planning actions worked on a coordinated strategy so that the actions might have some coherence to them. Many actions were known to no one except the particular affinity groups planning them. However, a couple of others were public. Of special note, two actions involving nonviolent civil disobedience had been approved by DAWN. One was an action by the War Resisters’ League and co-sponsored by SOA Watch calling for a march from Ground Zero to Madison Square Garden. There, protesters when stopped by police planned to run into the streets and have a die-in to draw attention to the many victims of the policies of the Bush Administration following 9/11. Another action, one that I had been personally involved with thanks to Mike from the Green Bloc, was called the Truesecurity action. It involved holding space at Herald Square, which was one block from Madison Square Garden and right in front of Macy’s. Its aim was to show an alternative to the security culture. The cluster encouraged affinity groups to take creative action in demonstrating against empire or for democracy. Both actions brought great risk of arrest since both called for civil disobedience. To prepare for A31, organizers called a Spokes Council meeting. A spokes council is when affinity groups nominate a spokesperson, or spoke, to speak for the group in a meeting. At the meeting, these spokes vote on proposals that are agreed to only by consensus. This particular meeting involved more than 150 people in a crowded Brooklyn building. It was a really nasty building, but seeing so many beautiful people in this room was a great sight. What’s more, even though there were 150 people, the meeting ran smoothly and was facilitated nicely. Often, in meetings of only 15 people, we have trouble keeping order. Here, such a large group of people worked efficiently and effectively, knowing that there was a great interest in keeping the agenda moving. Of course, we were sure that undercover cops had infiltrated the meeting, and so details of actions were discussed only at the broadest levels. I have to say that it was quite exciting. So many names that we hear about in the movement all were in this room talking, but all people there were equal before the group. I was amazed that such a level of organizing was happening without the slightest whiff of a hierarchical leadership. Many of us have dreamed for moments like this, and here it was in a dark Brooklyn room. Loaded with information, I returned to the church and those remaining with us. Besides sorting out the entire housing ordeal and the problems there, I was intent on getting our affinity group on the same page. At the church, I joined up with David and Nat, and we talked in great detail about what we wanted from the next day and what to expect. We all agreed that we did not want to be arrested but that it might happen. Since New York does not simply allow those picked up to plead guilty and pay an immediate fine, all of us decided that it was quite unlikely that we would join the die-in. However, we wanted to participate in the march aspect of the action, which was supposed to walk safely on the sidewalks. We also became interested in ways we could help the Truesecurity action without much risk of arrest. When Chris came in, he chose to join us as well and agreed with our plan of action. Andy and Ria eventually chose to join us as well on the understanding that we were not in this to get arrested or to do anything illegal, though we would show solidarity with those who felt called to nonviolent civil disobedience. As you can see, suddenly there was a purpose for the next day, a plan of action, and general preparation for what might happen. None of us hoped to be arrested, but we all knew that even if we tried our hardest that it was possible. This in itself shows a general lack of faith in our criminal justice system. So many people are arrested without cause, prosecuted without cause, and imprisoned without cause. We had seen too much over the past couple years to believe that if we simply behaved ourselves that nothing would happen. Otherwise, we would feel no reason to be out in the streets protesting. So much had happened in so few days. In the past, such an account would have sufficed for an interesting and full report of a very special time. Yet, what would happen next would be one of the most special experiences of my life. I can’t wait to share it.